A good pizza is hard to come by. Fact is many places haven't a clue to what they are doing. You can pretty much assume 70% of pizza shops don't actually "make" pizza. Here are some easy ways to spot impostors. 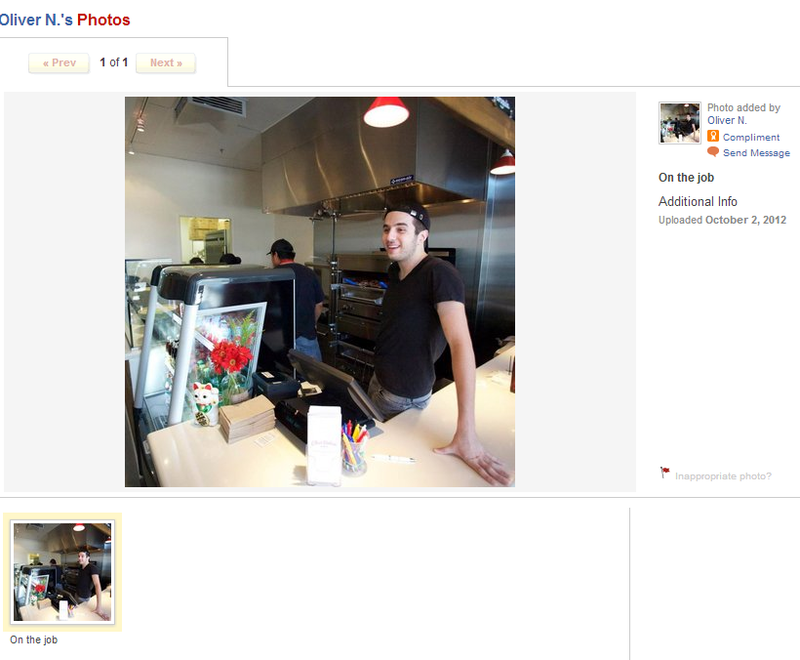 The Oven: This is the easiest way to tell if a place is legit or not. If they use a conveyor oven you know they're only one step above 7-11 pizza. 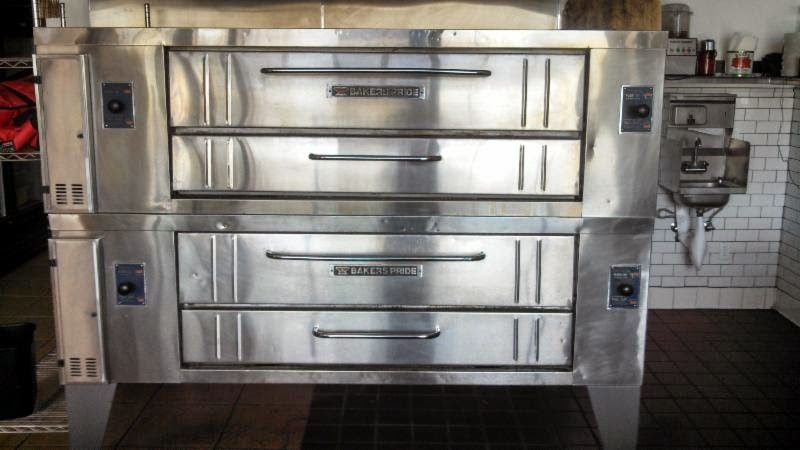 Look for a deck oven. 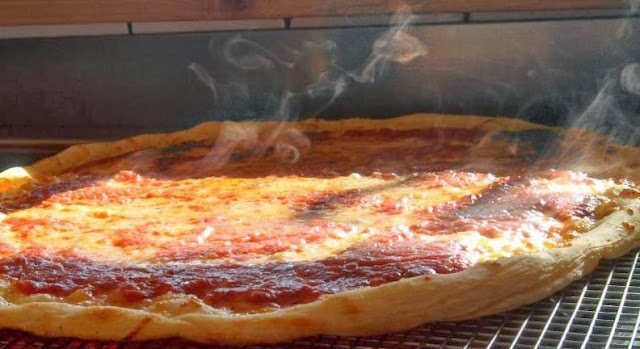 I'm talking classic pizza here. The kind you get delivered and have pizza parties with. We use a Bakers Pride Y-802. 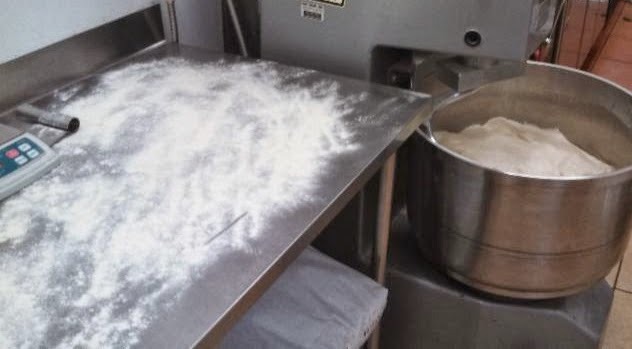 Dough: It's sad but true that a lot of places use frozen dough. Yes it's easy but it's like a burger place using frozen patties. 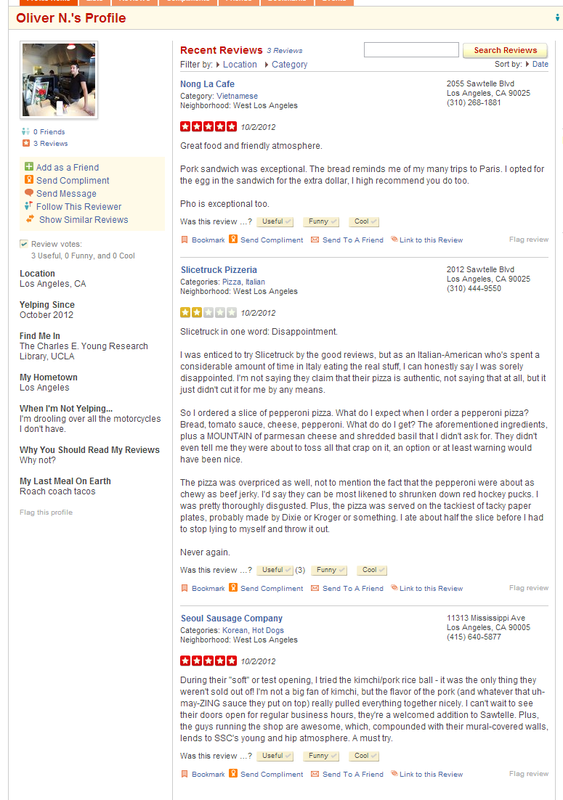 It's just unacceptable if you are going to consider yourself a true Pizzeria. Ask a few questions if you're not sure. Like what type of flour they use or if they use dry yeast or fresh yeast. I'd bet most people couldn't give you an answer because it doesn't say on the box of frozen dough balls. 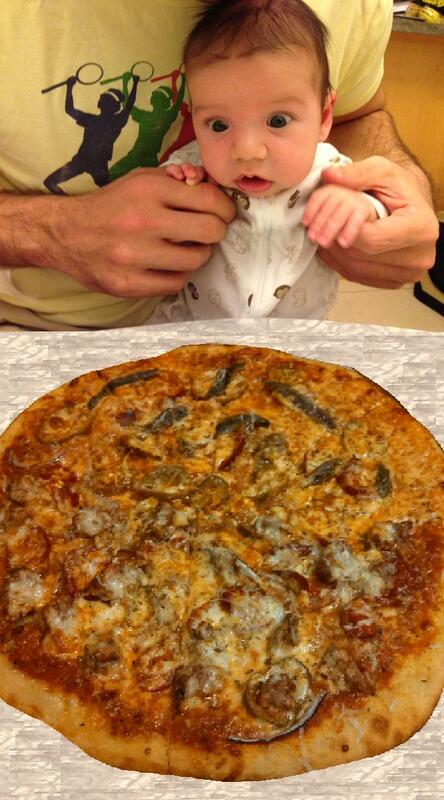 Finally, just look at the pizza. 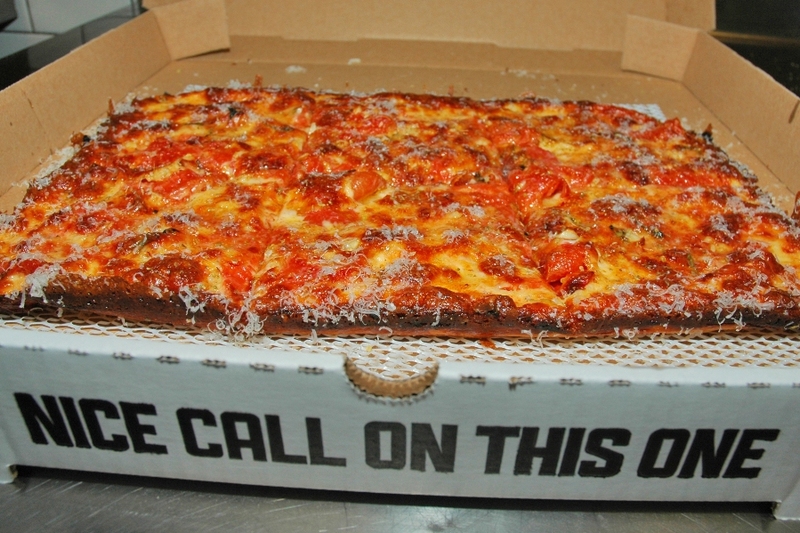 Since you have already eaten a Slicetruck pizza you know what a real pie should look like. A little char on the crust, some browned cheese. Thick cut pepperoni, maybe some fresh crimini mushrooms or real pineapple. Sausage made in house daily using Niman ranch pork. You're a smart person, right? I don't need to tell you why my pizza costs more or why comparing me to one of those other places is absurd. You get it. Girl Scout Cookies are terrible. What the hell happened? Sometimes we get pizzas ordered that make me wonder,Why? If you're having trouble deciding what you want, try one of these. Do you love me?...... Really? " I love you Babe....here's some chocolate. Let's make love!" Alright, you are not the most romantic guy. Nor the classiest. You have trouble showing her how much she means to you. This Valentine's day you want to get her something that says, " I love you. 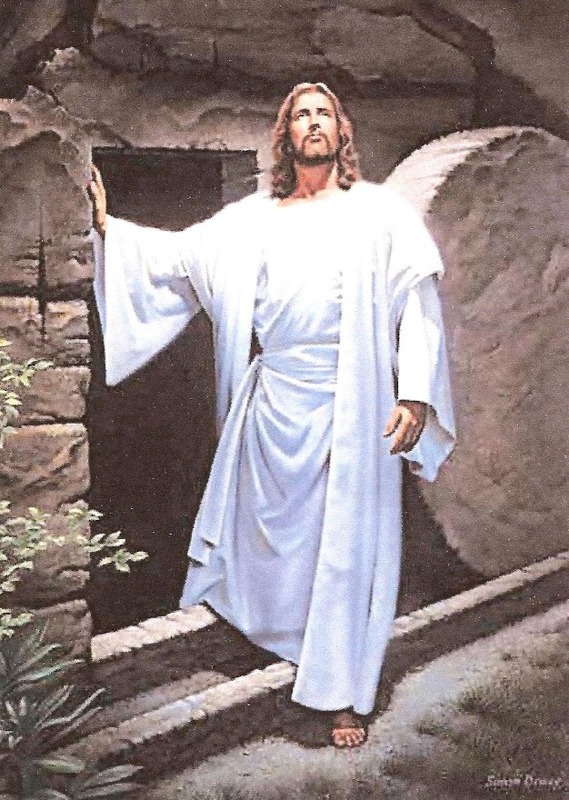 Without you I would be a lesser man. You Baby, mean everything to me." Chocolates are nice. But chocolate doesn't let her know that you would kill for her. Like you would actually break that dudes neck if only you were way stronger and more crazy. And flowers are a must. No matter what you do grab at least one flower for her. Too many and it seems like you might be feeling guilty for how you treat her. You probably are a jerk sometimes. But flowers can't convey that deep love you feel inside. That feeling you get when you're walking and you think of her and it makes you want to skip down the street smiling like you just took acid at a Phish concert. Flowers do not tell her that. There is only one way to prove the undying murderous psychedelic love she provokes in you. 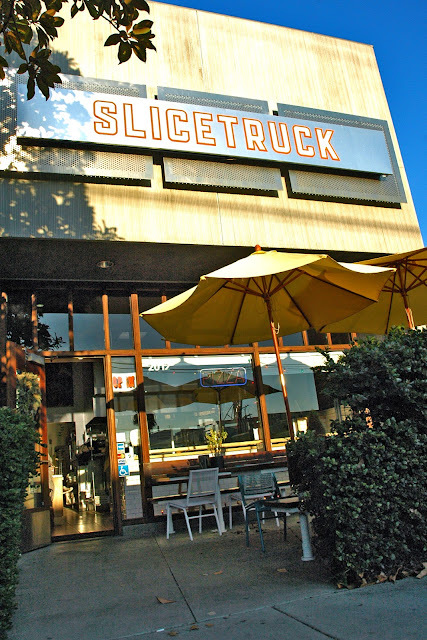 Slicetruck. We are making a Heart shaped pizza this Valentine's day to help you show the one you love that you do in fact love them. We are only making one size. 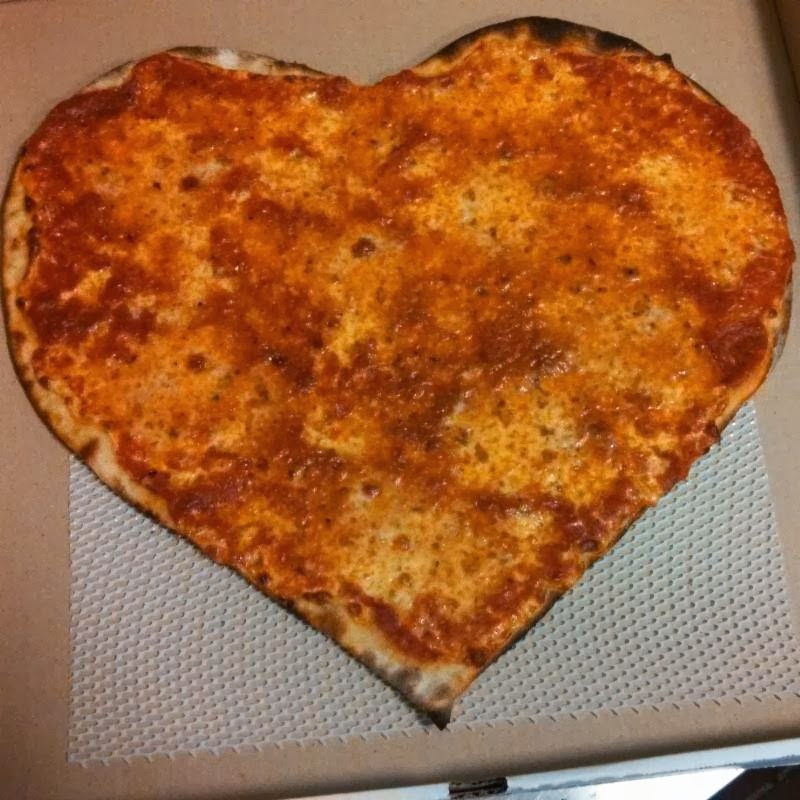 To get a heart shaped pie order an 18" pizza and ask us to make it a heart. ONLY 18" PIZZAS. You can order online and write in the note you want it heart shaped. But remember, YOU MUST ORDER AN 18" PIZZA. My SOCAL Hipster love song of the day. Valentine's tip for the ladies: Act like you like your charm bracelet. And don't tell your single friends how he bought you a heart shaped Slicetruck pizza. It will only further their depression. Tip for singles on Valentine's day: Order yourself a pizza and pig out. Do yourself a favor and DO NOT complain about being single on Valentine's day. This isn't a pity party. 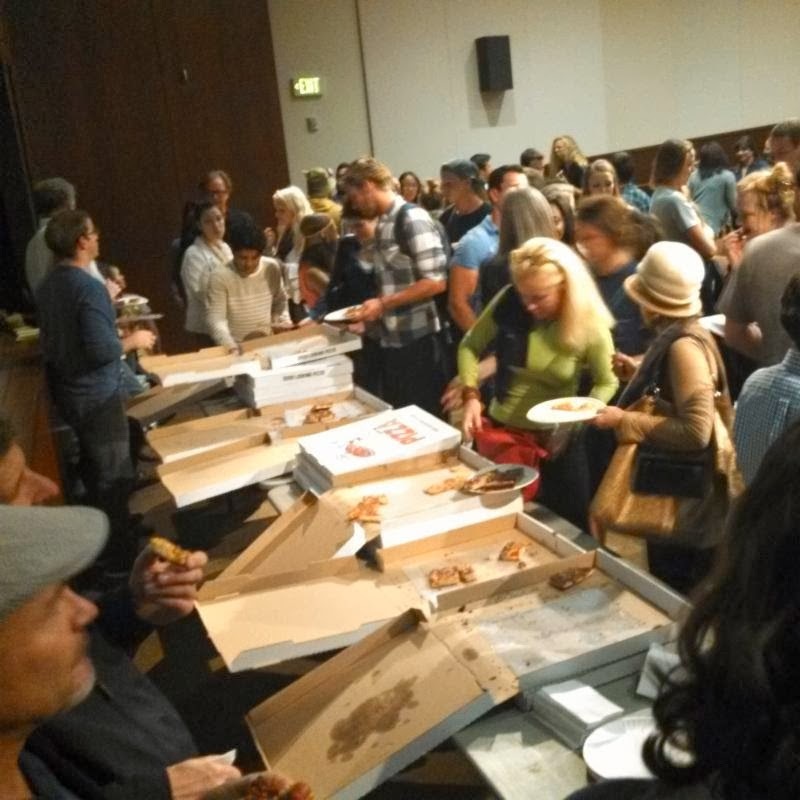 It's a pizza party! I want a free slice of pizza! 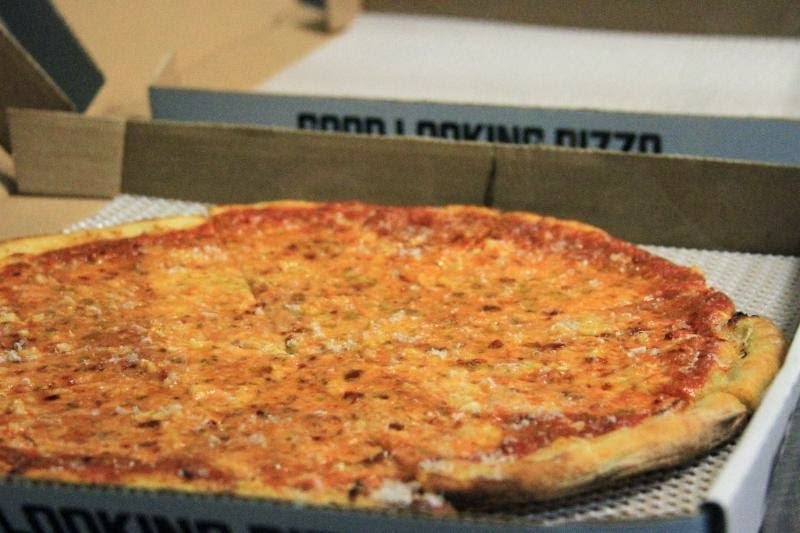 So you want a free slice of cheese pizza? Here's what you do. 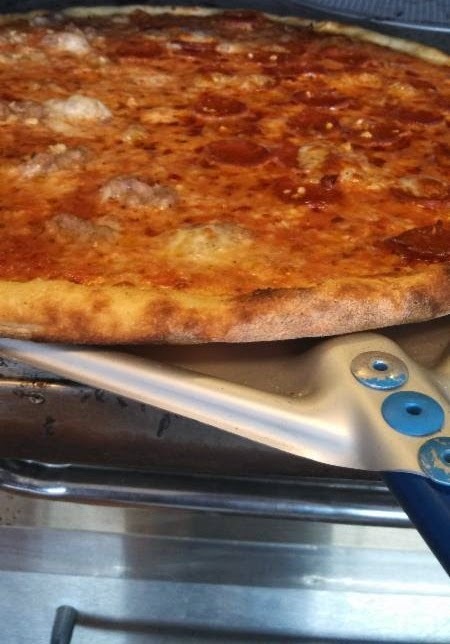 Take a picture of your pizza and post it to Instagram and hashtag that sucker with #Slicetruck. You can then add one of your famous hashtags like #fatgirlproblemsdontcarenomnompizzapizza. Just show us that you posted it and follow us and a free cheese slice comes your way. Must be a picture of a whole pizza or partially eaten pizza. Not pictures of slices. Obviously you need to be in the store to show us. Be cool and have fun with it. Like a picture of you eating pizza under water by a coral reef. Perhaps the Great Barrier Reef. Remember, if you have an account online you receive 10% back after every $100 spent online! So if you don't have an account get one today! This is just an explanation of our online rewards system. Do not call requesting 10% off your order. Seriously do not call us saying you got a coupon for 10% off. This is not a coupon! Who's that girl stealing our tip jar money? Watch this girl steal the money out of our tip jar tonight (January 14th 2015). This girl is still in action a week later January 23rd at Delicious Arts Bakery in Westwood. Anyone know her? Anyone get her license plate? Come on internet, solve the crime. I make a lot of pizzas. And I judge every person based on their order. I can't help it. I'm a terrible person. If you get ten toppings on your pie it makes me wonder if everything is ok with you. I worry that you might be over thinking the whole process and I just hope and pray that your decision makes you happy. I literally say a prayer for you when your pizza leaves the shop. A sausage pepper and onion pizza gets my respect. I assume you are well established and know what you like. You've ordered enough pizzas to know that keeping it simple and classic is the way to go. Same goes for the pepperoni mushroom fans and especially the cheese pizza people. And I mean the adults that order a cheese pizza. I don't care that a kid likes cheese pizza....of course they do they're a kid. They kind of eat whatever you feed them. So put the basil on the pizza and raise an interesting person. 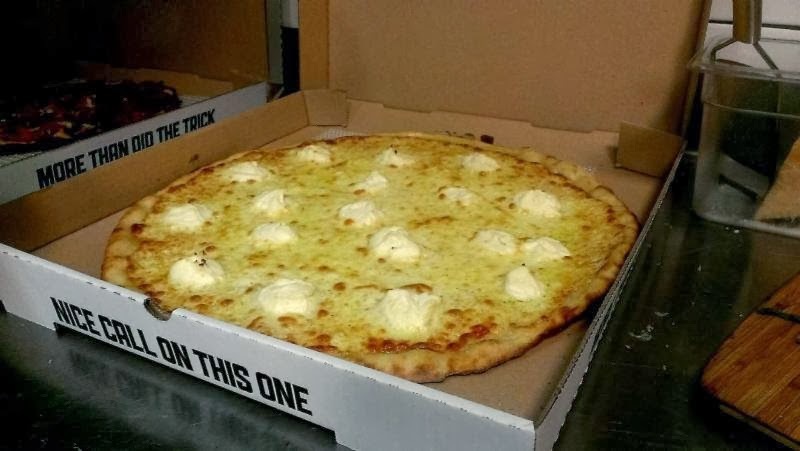 To really upset me order a half cheese half five or six topper. Boy that gets me. I thought relationships were about compromise. The person that needs all those toppings should really get their own pizza. You should understand that your selfish needs are causing half a pie to be overcooked to satisfy you. Who do you think you are? I hope you're paying for it. If so, you can do whatever you want. The other person should have been on board with your awesome combination. 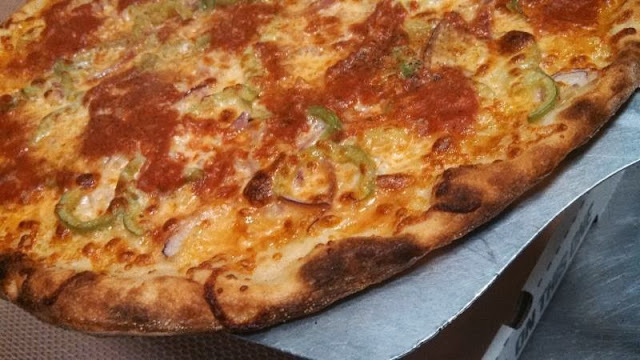 So this week I am giving you a chance to crazy up your pizza with an extra topping for FREE! Simply type the free topping in the NOTE section when ordering online or mention it when you call in. 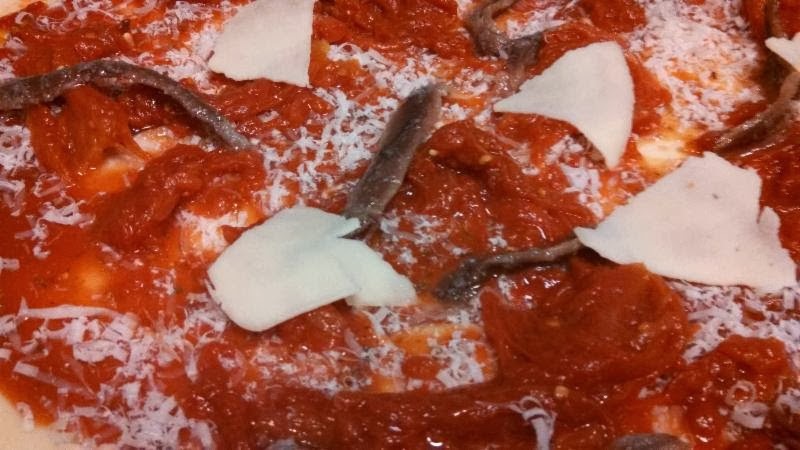 Example: Free anchovy. Careful not to charge yourself. Then it won't be free. Tossing dough while Oliver gloves up to do something important to a pizza. I moved out here about four years ago with my brother to start Slicetruck. He was living in Brooklyn at the time while I was in Illinois. We grew up in a suburb just west of Chicago. I also lived in Brooklyn for a few years while my brother was there for more than ten I believe. 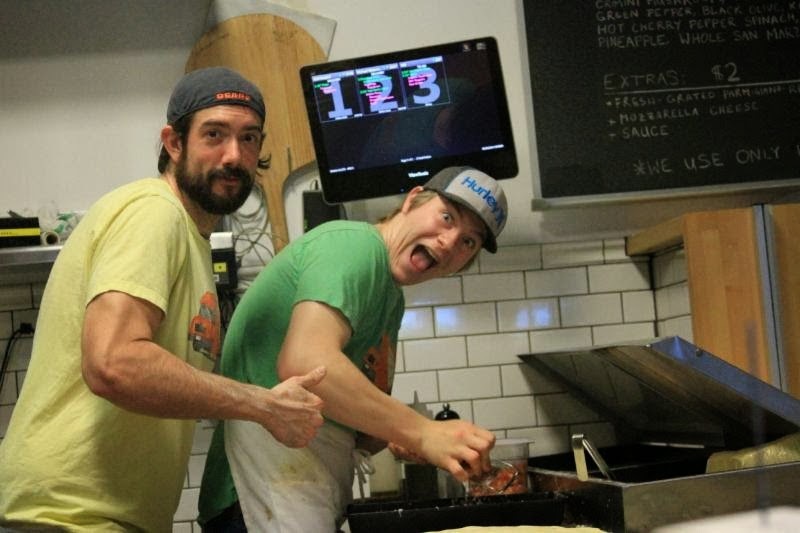 So you're thinking, "Chicago and New York...of course these guys know pizza!" And it's true, we always knew a good pie when we had one. 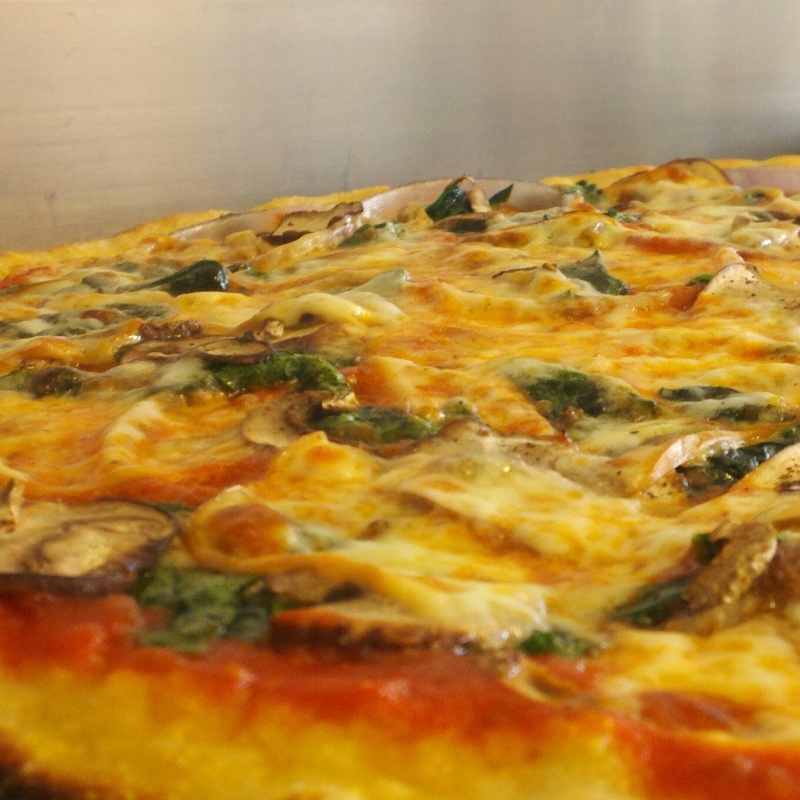 But the truth is we had never made a pizza before starting Slicetruck. The early days were a mess. Embarrassing really. Using pre-made dough sometimes even par-cooked. Shameful. But in our defense we had no idea what we were doing. So anything that resembled a real pizza was exciting. Luckily for Los Angeles the Hanley brothers have a little thing called pride. 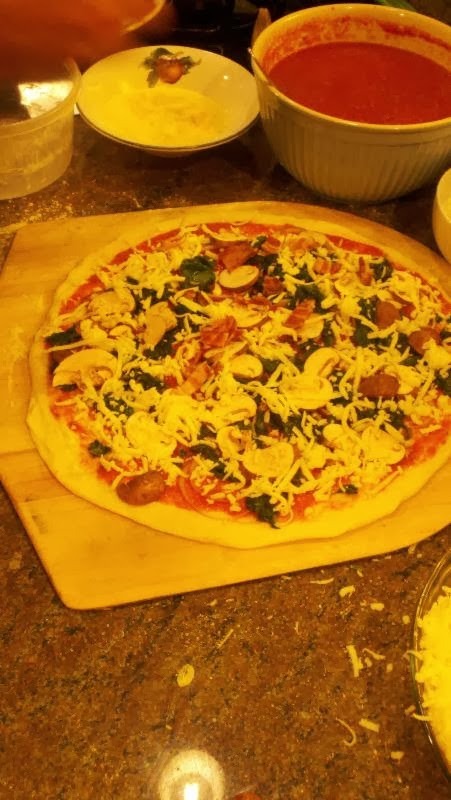 And after many nights on our deck drinking and acknowledging our terrible pizza making, the focus of our business changed from selling as much pizza as possible to crafting the best pizza possible. Without any real knowledge or training we went for it. 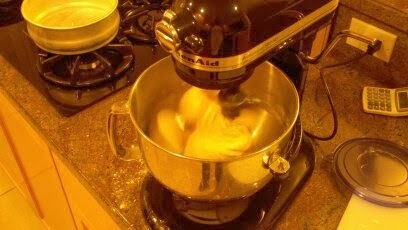 Some nights we stayed up making four or five different batches of dough. testing different hydration to salt content to water temp. You name it we tried it. 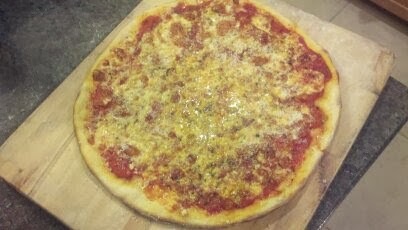 So proud of our pizzas.Before we bought the pizza peel we were using cardboard boxes to slide the pizzas in the oven. A lot of pizzas were sacrificed in the process. A lot has changed for us since moving here. 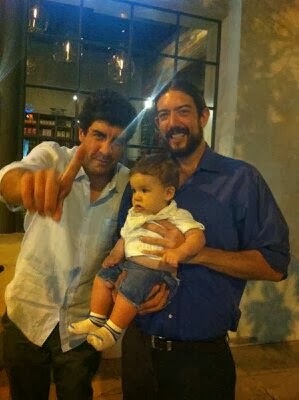 I hold my nephew while my brother explains where we rank in pizza. 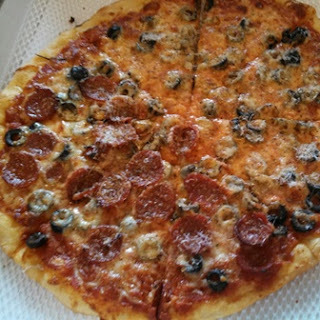 So why tell you about our awful beginning making terrible pizza? We are from Chicago and have lived in New York. But our pizza is truly Los Angeles. Making our first batches of dough in a beach house in Venice. 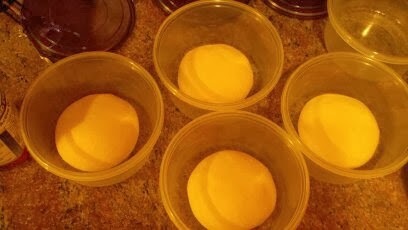 Started using Kamut flour while living in Playa del Rey. Using our food truck to gain confidence in ourselves and product while traveling all over the county. And finally selling the truck and opening up shop on Sawtelle blvd. We are out to be the best in Los Angeles and the country...even the world. Dead serious about making Pizza. 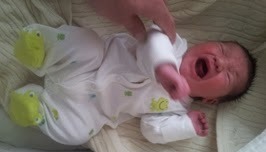 Not my brother but Oliver in green. What's the deal with the Parm? 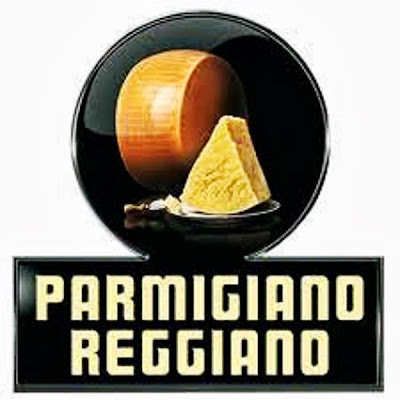 Some people seem to think parmesan should be given away. As much as they want however they want to use it. I might be willing to do that if I used a common parmesan. But I don't, so I don't. I use imported D.O.P. certified Parmiggiano Reggiano. We freshly grate it on every pie and fill those little cups with it every day. From these deep roots in a protected and respected environment, come the unique qualities, which characterise the "king of cheeses". Since medieval times, when the Benedictine monks started producing these great cheeses specifically for long maturation, man has joined with nature, leaving it untouched and improving only the areas of man's intervention. We make our own dough, sauce, sausage, salad dressing and cookies. Sausage goes on the pizzas raw and is cooked with the rest of the pizza. If you create an account online and order online, THEN you get $10 back for every $100 you spend. AND since our prices include tax you're actually getting a bonus on taxes that you paid. This is UNHEARD of. We buy bricks of mozzarella cheese and shred it on site. We only have one type of oil in the shop, extra virgin olive oil. We're very unsure about our name. 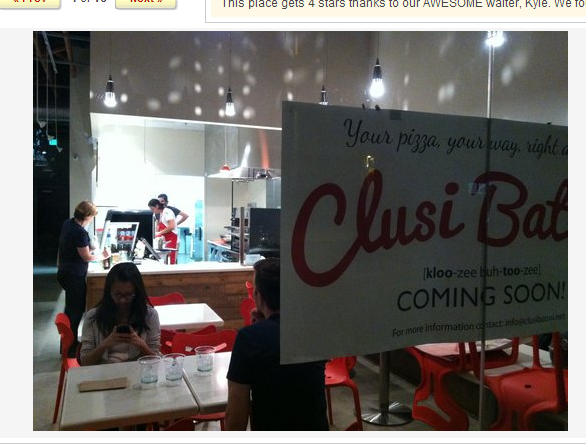 We started as a truck and its hard to find a meaningful original name for a pizza shop. Writing twitter posts is very hard. A few people were offended by the nicknames they got on the last mailing. We have a hotbox truck that can deliver 100 pizzas over 100 miles while keeping the pizzas piping hot. Tax is included in all of our prices. 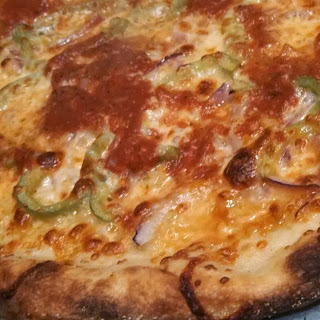 95% of our customers order take out or delivery. 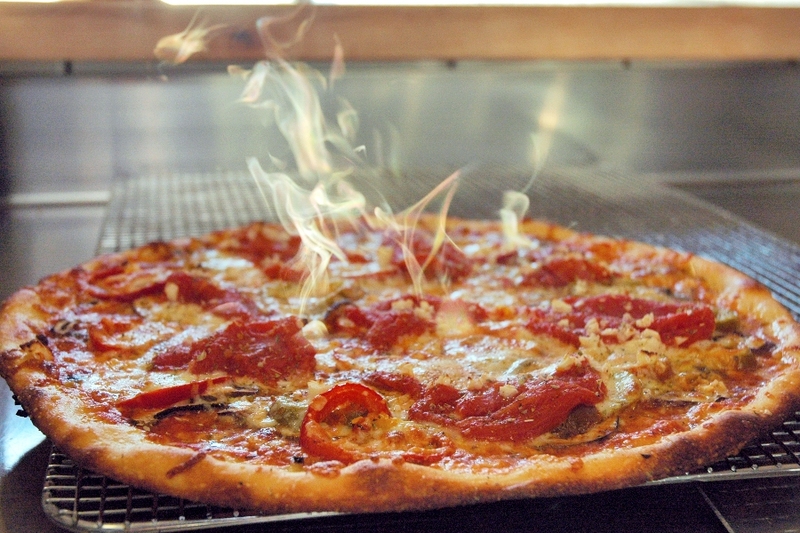 Slicetruck has never advertised itself as New York style pizza. 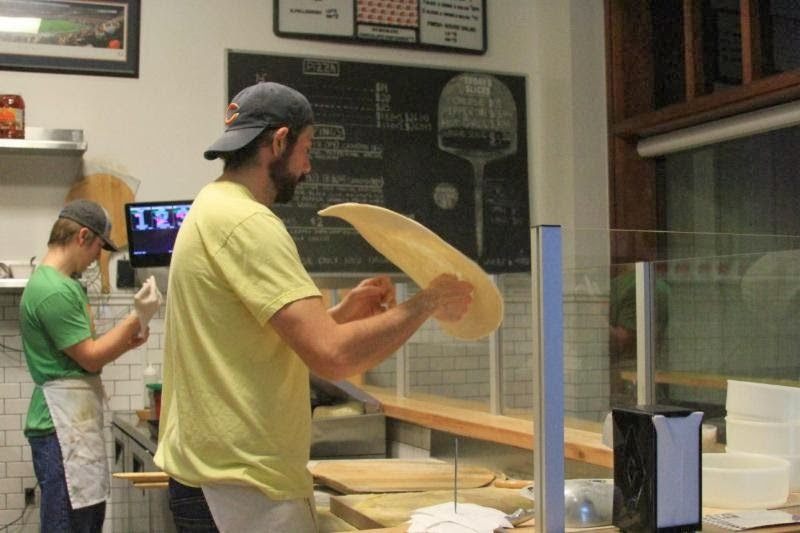 Owning a pizza shop isn't as glamorous as it seems. This picture is a pizza with various half toppings. We don't totally agree with half toppings. The pizza will cook a bit unevenly in many cases.